During the first QSO it became clear that my RX side was not performing well. At that time I got 0.9 dB moon noise and 12.4 dB solar noise. I tried to optimize the pre-amp I am using which surely worked out. I improved my solar noise to about 14.5 dB and the moonnoise to about 1.3 dB. After this I decided to buy a new preamplifier at DB6NT with 0.6 dB noise figure. This gives me an more improved performance with 1.7 dB moonnoise and 15 dB solar noise. Now the RX is also working well. Still have to find out differences between Apogee and Perigee and full and new moon. I expect some difference but I don't know how big the difference will be. If you could give me info I would be very pleased. I found the article from DJ7FJ titled "What's different on 10 GHz EME ?" which gave me valuable information on moon noise related to dish diameter. I made an Excel spreadsheet to calculate the different noise levels I should get assuming some values for moon temperature and solar temperature. I am still working to optimize this Excel sheet. When it is working fine I will also publish this on this webpage. If you find this table useful and want to add your info please mail me your info. 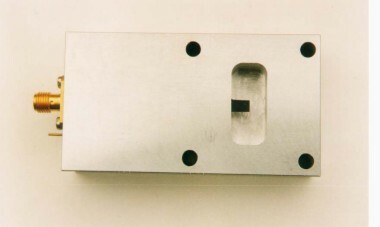 I am still puzzled on moonnoise. Last measurements gave me a moonnoise level of 1.9 to 2.0 dB which is much more than the 1.7 dB from before. Moontemperature is not always the same, it needs to warm up and we have maximum moontemp about 5 days after full moon. 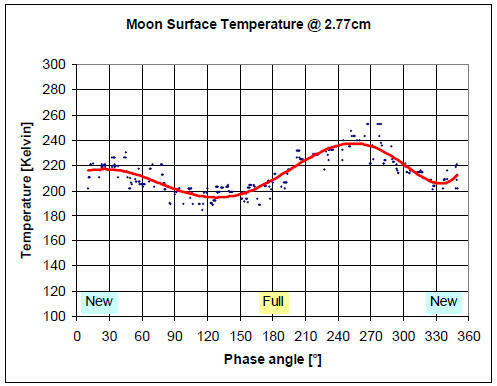 After reading this article on moon temperature, I understand that we only measure max moon noise at about 250 degrees of the moonphase so about 5 days after Full moon. Be aware that we also need Perigee for max moonnoise so search for a combination with Pertigee and 5 days after full moon.